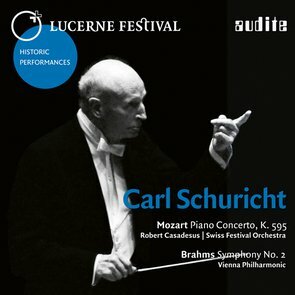 Absolute faithfulness to the musical text and youthful vigour right up to old age: Carl Schuricht (1880−1967), one of the last representatives of the generation of old German conductors during the post-war decades, focused on clear structures rather than romantic pathos or personal eccentricity. These two Lucerne live recordings demonstrate the compelling persuasiveness of his inspired objectivity, especially when performing alongside the celebrated Mozart interpreter Robert Casadesus, whose choice of tempi is particularly striking. The 32-page booklet in three languages provides extensive background information on Carl Schuricht and his relationship with the Internationale Musikfestwochen in Lucerne, and also features photos from the festival archive, published here for the first time. The Historic Performances CD series presents live concert recordings of influential Festival artists. The sound quality of the original tapes has been painstakingly restored, and each release is accompanied by extensive documentation of its historical as well as artistic significance, together with photos and historical material from the LUCERNE FESTIVAL archive – a history of the Festival in sound.